"To provide a facility for the test and evaluation of subsonic aerodynamic decelerators, related equipment and training." In 1988 Stephen L. Snyder, 1935-1999, and Robert A. Mathews realizing the need for a dedicated private sector test facility, established the National Parachute Test Center, Inc. (NPTC). Various locations were scouted with the following parameters in mind, weather, airspace, terrain, political climate, and access to industry. Following several months search Dunnellon Airport in Marion county Florida, possessing the best combination of the above features, was chosen as the location for NPTC. Shortly after NPTC’s establishment it became apparent that this test facility could be utilized by entities other than Radial Corporation. 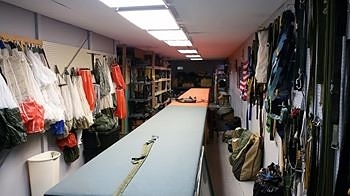 Additionally the facility lends it’s self not only to the testing of parachutes, but to training in their use and associated equipment. To that end invitations were extended to various organizations, both private sector and government, to use the facilities.